It started innocently, as I watched rain fall in the valley in February in Jackson, WY thinking that it shouldn’t be raining in the middle of winter. When the wheels starting turning about my impact and the ease at which we many of us can fly across the world when we don’t like the weather in our towns, I personally wanted to make a choice to change. 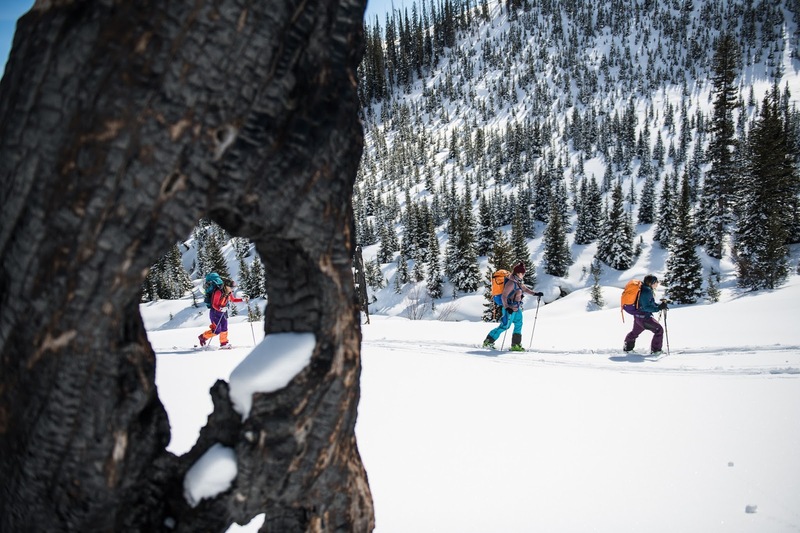 As a splitboard mountaineer lucky enough to live in the Tetons, the breadth of exploration, new lines and challenges is vast. I’ll be honest, I’ve spent most of my life up this point in constant motion traveling to all sorts of places, but for the first time I wanted to change that habit and redefine exploration and adventure as something centered around my backyard. From there Backyard Dispatch was born. 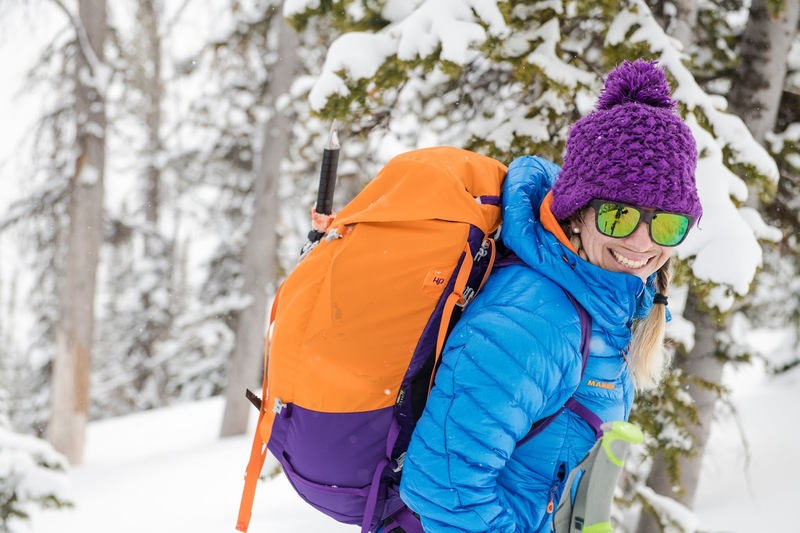 The goal was simple, limit travel to trips that were needed for work and focus on exploring new areas, ranges and lines within a 50 mile radius from Jackson. 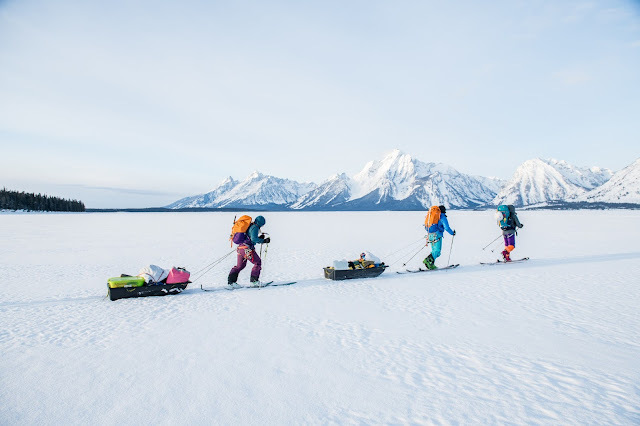 With that in mind, I reached out to a few close friends and put together a small team to kick off the project in the Northern Teton Range, where I’d never ventured in winter. 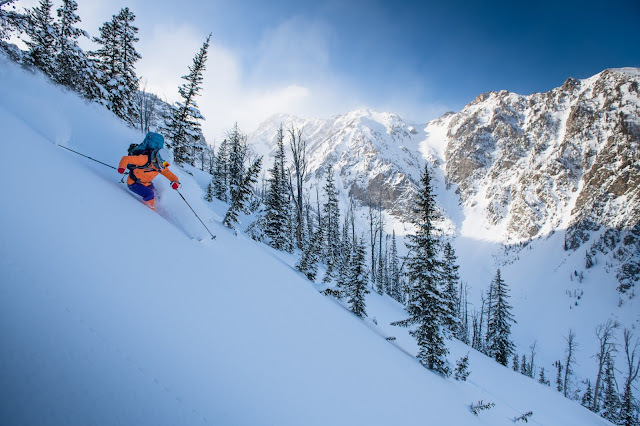 The team consisted of Morgan McGlashon, a Jackson, WY native, talented ski mountaineer and a wealth of knowledge when it comes to skiing peaks in the area. 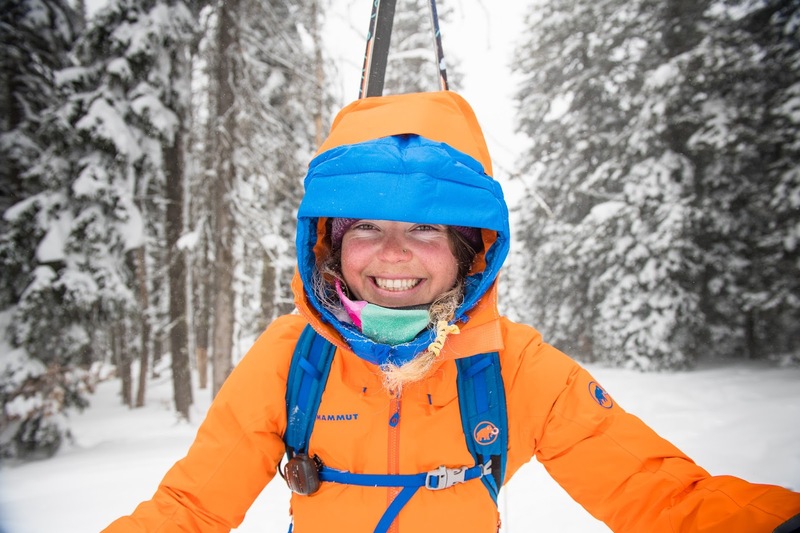 Pip Hunt, a former Jackson resident and professional skier. 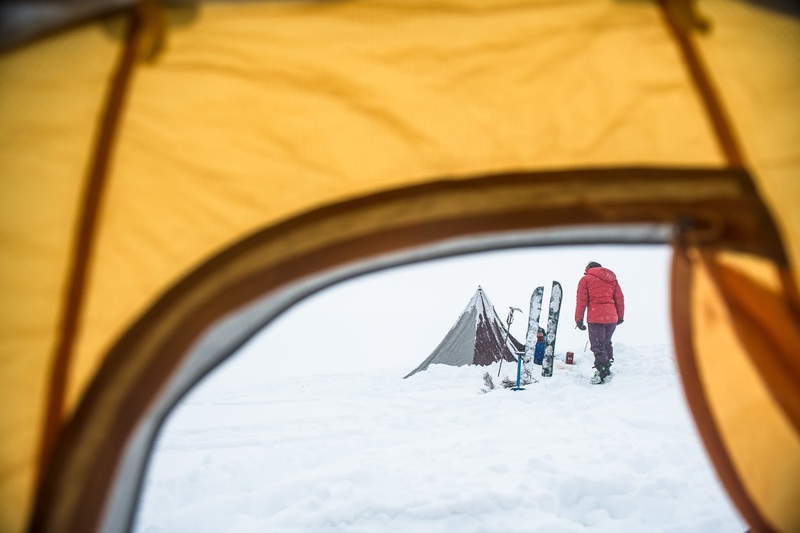 Plus, Freya Fennwood, a talented outdoor photographer to help us tell the first part of this story. We packed up 4 days worth of food and winter camping provisions to cross Jackson Lake in the northern part of the Grand Teton National Park and explore an area called Waterfalls Canyon. On paper it seemed straight forward as most trips do, but nothing ever goes as planned and this trip was no exception. 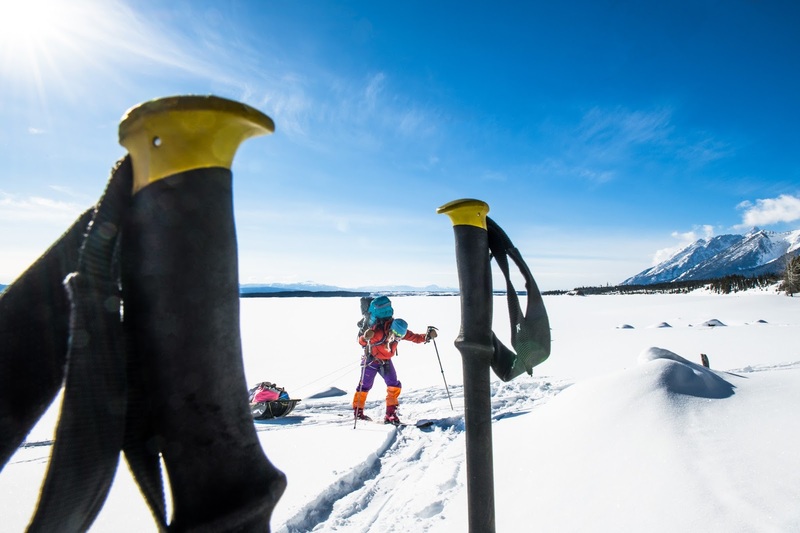 It was 9 degrees and clear as we packed up the cars with two industrial sleds and began the trek towards the lake. 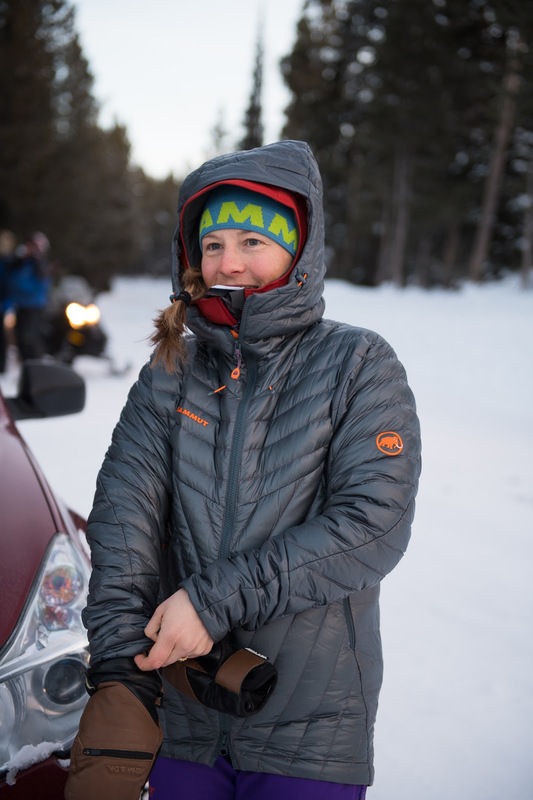 The mood was light as we made our way north, and I was secretly excited for the heated bathroom at Colter Bay as the last stop for artificial heat before we launched. The sky was streaking pink as the misty light of dawn began to clear the horizon when we parked the cars and unloaded the sleds. Mount Moran rose in the distance as a great white behemoth guarding the gateway to these peaks. We hooked ourselves up to our sleds and took off across 3 miles of frozen expanse towards our destination. 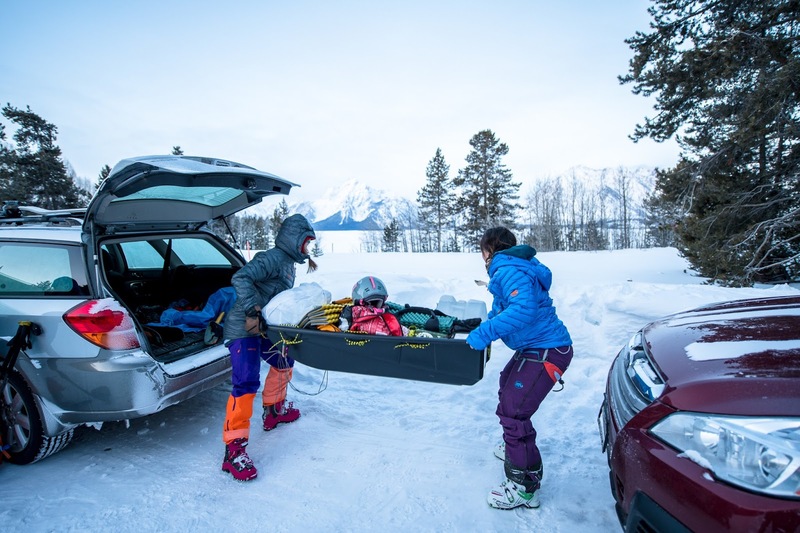 Pip Hunt and Rachel Reich unloading the sled. The outside air temperature was biting, but soon the sun came up and we couldn’t stop staring at the terrain ahead of us. There’s something about the mountains shooting straight up into the air from the flat lake that can only be experienced in person. Two hours later, we dragged the sleds up on the banks of Waterfalls Canyon and quickly scouted an area to set up camp. Pip Hunt at the end of the 3 mile lake crossing. After taking the time to set up tents so we had a home base to return to, we geared back up into exploration mode and stuffed our packs with snacks. Meandering along the river into the canyon for the first time, the peaks kept teasing us while the forest blocked a clear view, until suddenly the valley opened up and we could see what lay ahead. Inspired by what we saw, we pushed on into the canyon. We had an objective in mind for the following day at the back of the canyon and headed that direction to scout it. 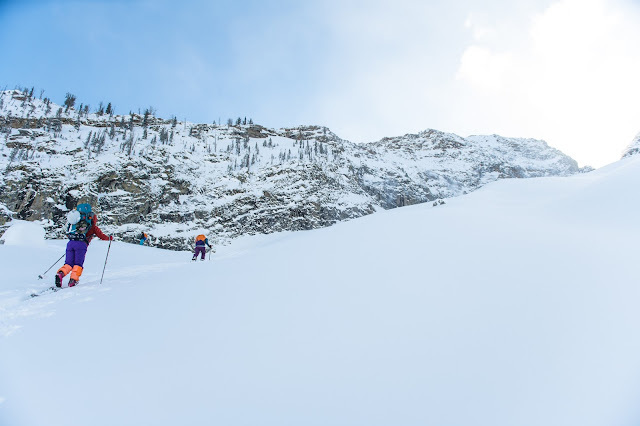 After making it to the first headwall in the canyon and taking a moment to look into a couloir we were interested in tackling the following day, we briefly chatted about what we should ski. Surrounded by chutes on all sides the options seemed limitless, but based on the heat of the sun, we chose to meander up into the Eagles Rest Peak Cirque to get into something shaded and north facing. The temperatures were exceptionally cold in the shade and as we crested into the cirque itself the wind picked up bringing the wind chill below zero. Reaching a topping out point, we transitioned and dropped in to a series of steep, rock lined and powder filled barrels. The skiing and riding was incredible; steep, with rock fins and light density powder from the top back down to the valley floor. We all giggled back and forth as we took turns dropping. Reaching the bottom we threw our skins back on and made our way back to camp as the sun began to set behind the peaks surrounding us, looking forward to making some hot food and drinks and putting on many more layers. 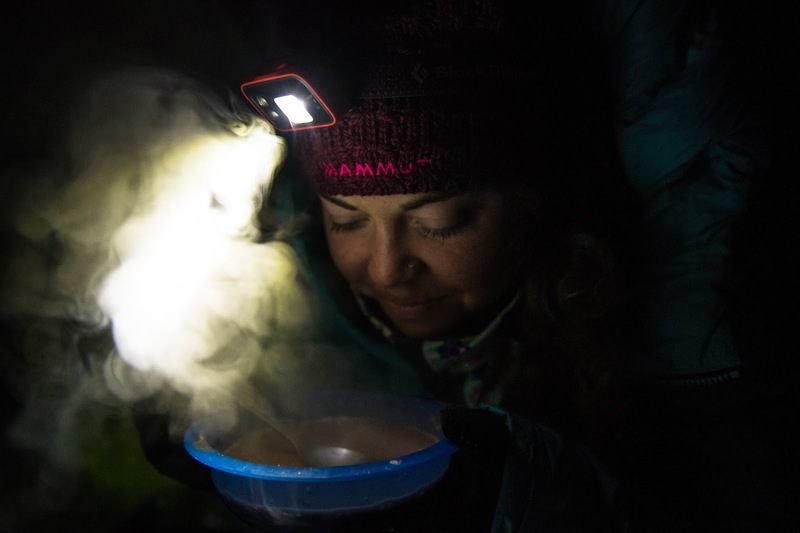 The temperatures dropped towards zero as we huddled in the cook tent re-filling our water bottles over and over with boiling water to keep them from freezing shut. Starving we first snacked on what was available, made hot chocolate bone broth protein concoctions and then dove into a dinner of pre-made lamb stew and mac and cheese. Touching on our plan for the following day, we decided to get up at 7am and venture back to the objective we had scouted. 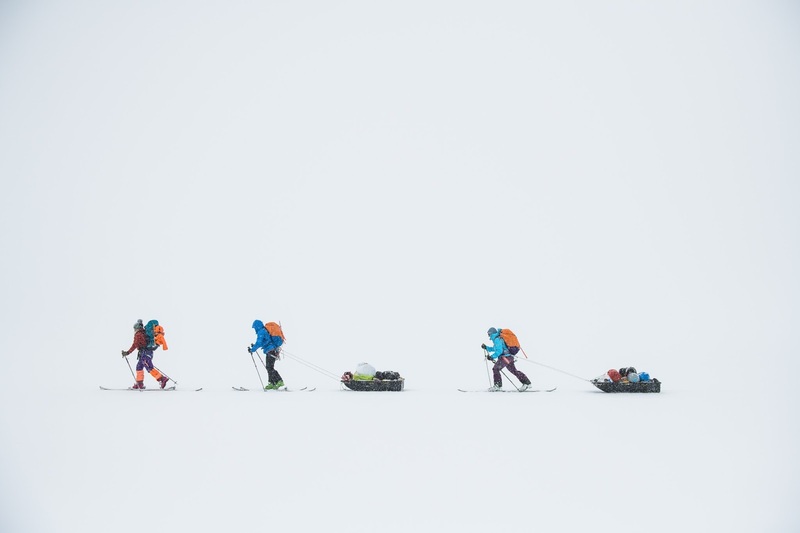 There was weather forecasted to move in overnight but the team was hopeful we might get lucky as we had that day and have better conditions in the morning. 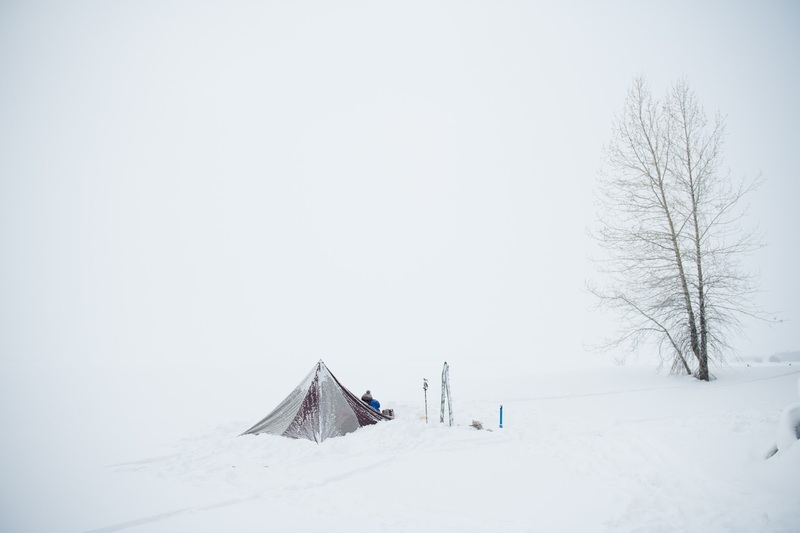 Armed with all our hot water bottles, we scampered off to the warmth of our sleeping bags and tents well before 10pm. As I cracked my eyes open to the morning light and my alarm, I could already tell snow had fallen over night. I took a moment to get my bearings and checked the updated weather and avalanche forecast, which did not look good. Temperatures we forecasted to be even colder than the day before with snow, and wind. South, southwest wind to be exact up to 40 mph gusts which would load the top of our objective as we climbed it during the day. Rachel Reich assessing the weather. 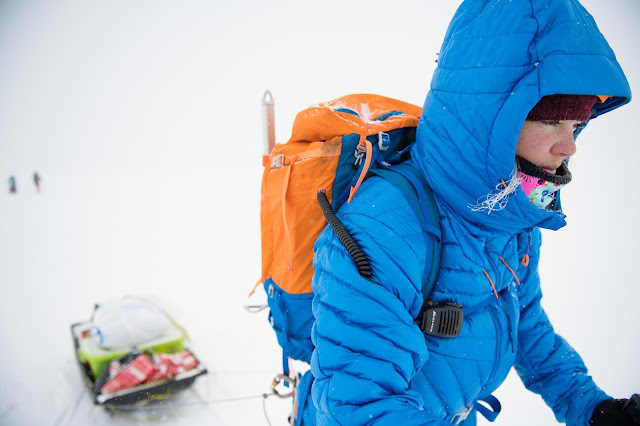 Rustling out of the warmth of my down bag, I threw on all my layers and headed out to make coffee for the team. No choices should be made without coffee first. Pip, Morgan and Freya joined me as we started talking about the weather coming in. Already there was snow on the ground and visibility was pretty low. With caffeine beginning to flow into our blood stream the team overviewed the options. We could stay, ski the burned out forest on a ridge that overlooked camp, or in the trees on a peak adjacent to us and pack up a leave that evening or cut our losses, cross the lake again before our tracks were re-covered and explore other areas. As we looked across the lake seeing nothing but white, we all understood the weather was only going to get worse, making it certain we’d be navigating later either by a compass bearing or our GPS apps. Maybe it was the fact that we’ve all experienced varying levels of epics in these mountains, but taking it all in it seemed obvious that re-crossing the lake before our tracks were covered was going to be the best choice. Although in my heart I didn’t want to leave, I’ve learned suffering for your egos sake or holding on to an idea too tightly often ends in a negative way. Re-crossing the lake in a cotton ball. We quickly packed up and took off into the surrounding ping pong ball that was Jackson Lake, with discussions of what plan D, E and F were going to be. Three more miles later as the shore came into view and my feet were screaming at me to remove my ski boots, I was reminded the beauty in exploring your backyard…there’s always a new place to ski powder and endless options when the weather doesn’t cooperate.